While planning their Canadian RV road trip, many visitors ask whether they need to have a special driver's license or an international license to drive an RV in Canada. The answer is simple: no, you do not. You just need to have a driver's license that is currently valid in your home country to rent an RV in Canada. 1 - It must use the Latin alphabet. 2 - Principal and extra drivers must have had their driver's license for at least 12 months. In all cases, you must be 21 years old or older to rent an RV. 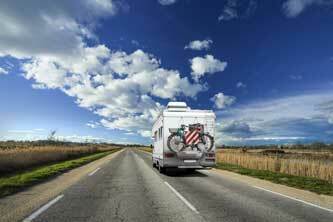 For European residents, a Class B license is required to rent an RV in Canada. Swiss residents must have a pink license. If you do decide to use an international license, don't forget that you must also have the original license from your country in your possession AT ALL TIMES. Your international license will not be accepted without your original license, and you will not be able to pick up your vehicle. The client must provide a credit card in the name of the principal driver. That means that, when picking up your RV, you must present a driver's license and a credit card IN THE SAME NAME. In general, rental agencies will pre-authorize an amount on your credit card corresponding to the deductible to be paid in the event of an accident. How much is the damage deductible?